Figure 1. 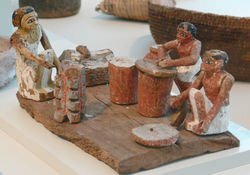 Model from Egypt, found in a wealthy tomb, showing a food preparation scene. Few places in a home are as important or symbolic for our social bonds than the kitchen. In almost every culture, the kitchen serves not only as the place where food is prepared, but serves as a social hub for families and friends. Humans develop deep social bonds with family and friends in their kitchen. The kitchen does not simply provide for our daily nutrition but also helps to reinforce our social character. Whether humans are cooking around a fire or chopping vegetables on a granite countertop, they are also interacting with one another. In early complex societies in the Near East, Egypt, and in the eastern Mediterranean, including Crete and Cyprus, many homes had open fire places or covered stoves with a fire burning inside (similar to modern clay ovens often used for bread baking). Stoves ranged from simple clay-made pieces to brick-made cooking places. The stoves for cooking were often in open places so that the smoke can escape. Most cooking, therefore, would be outside, although food preparation could take place nearby or in the same space. 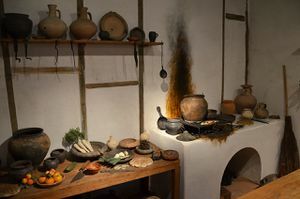 Some homes may not have had a specific place for cooking, such as smaller homes, where a shared communal space may have been used for making meals (Figure 1). Wealthy people generally had more elaborate rooms that had facilities for storage of foods, what were essentially pantries, that were often next to an open space for cooking. In very wealthy residences, or even palaces, food storage may have been more elaborate, where types of ice houses and large storage rooms would have been present. Some kitchens could also be enclosed, where a possible chimney could have carried the smoke for cooking fires (Figure 2). One interesting find is cuneiform tablets in Mesopotamia and other writings from parts of the Near East, including Egypt, have been found to sometimes indicate recipes. Although recipes on tablets have not generally been found in kitchens, it is likely chefs at more wealthy residences and palaces would have had access to these recipes as a way to prepare elaborate feasts for guests. The keeping of information on preparing favorite foods was now part of some households written records, making the kitchen an important component for entertaining guests. However, the kitchen itself was seen as a workplace and rarely as the main dinning area for guests. By the early Medieval period, kitchens had not evolved significantly. In fact, in the early Medieval period sometimes kitchens were more simple than those found in antiquity, where houses often simply had open pits or spaces where fires would be used to cook and warm the home. Spaces between the fireplace and any additional room or spaces were used as food storage and food preparation areas, although they were not always in the same place. More wealthy homes often had several rooms for food preparation and cooking, as different foods required different preparation methods and storage, such as cooler or more dry rooms for storage. Figure 2. Kitchen reconstructed from an ancient Roman house. In the late Medieval period in Europe, by the 12-13th centuries, kitchens in wealthier homes and palaces began to be more commonly separated. This created more class separation between areas where food was prepared versus areas where food was served. This had to do with the smoke and smells of the kitchen, which nobles were keen to separate. Alternatives included using sunken floor or areas to allow the smoke to escape using another way from the main building. In more common homes, fireplaces and chimneys were now more typically created, particularly around a side of the house or along one particular wall. This now made the corner or side wall of a larger room, or where chimney might be placed, as an area where indoor cooking was done. Pots and pans were now mostly metallic, where they were hung above a fireplace on stands. Stands or hung cooking wares could be lowered or raised to control heating. Although cooking was still mostly done in a basic space, by moving the cooking and food preparation space to a more isolated part of the house, thus reducing smoke in the living and dining area, the common living area or room where food could be shared became a more comfortable place to sit in. It increasingly became a space that became the primary social area of the house, as no longer smoke became a major obstacle for larger gatherings. By the 16th century, tiled heating was used more commonly, allowing the kitchen to be placed even farther away from the living area and the kitchen was no longer always needed for also heating the home. Heating could now be transported across the house and the heating source could also be placed at different locations rather than dependent on the kitchen. More homes now even had a separate building used for the kitchen, while poor homes still had to depend on a combined kitchen and dining area with ovens or a form of stove sometimes used for cooking. For wealthy rooms, as they could afford to have another room or even building for the kitchen, this increasingly led to social barriers where kitchens were regulated for servants' or slaves' work. The next major phase of development for kitchens occurred because of developments in stove technologies. The Rumford stove, designed in Britain in 1800, became the first household stove that could heat multiple items using a single fire source. The later Oberlin stove, from the 1830s, were relatively small and could be fit in most kitchens. Fire was fueled by wood or coal, where gas stoves were not introduced until late in the 19th century. As more foods now could more easily be cooked in kitchens with developing stoves, and increased access to goods for consumers, kitchen storage space began to be a problem. This led to the development of kitchen cabinets that were now designed to hold foods and spaces for spices, condiments, or even dishes. Other major changes occurred throughout major cities in the late 19th century. The first was water pipes began to be incorporated with homes, initially to help remove waste, but this was found to be useful for bringing water to kitchens, as it provided clean water to help clean and prepare foods. The second development was the creation of gas pipes in cities. These were created to help cities provide lighting for streets, but with gas and its prevalence now provided, a new fuel that could be used for firing stoves was introduced. Gas-powered stoves became more common and replaced the wood and coal fired stoves, helping cities to also become relatively cleaner by producing smoke that was less sooty. Stoves were also closed, forming designs that began to shape our modern ovens. Kitchens also began to change in their social outlook. For wealthy classes, kitchens were still working areas that were often a good distance away from the dinning areas. For middle classes, kitchens were next to or near dinning areas. For the middle class, therefore, as kitchens became cleaner due to better burning stoves and availability of water, kitchens began to become a new type of social space. People began to place tables and other furniture to use kitchens as social gathering spaces, while dinning rooms were used more for more formal dinners and less used for daily meals. Refrigerators became smaller throughout the mid 20th century, allowing these to be increasingly fitted into kitchen spaces. During the early to mid 20th century, new kitchen designs began to emphasize smaller kitchens that were intended to be used as efficient spaces for food preparation. This led to the reduction in the use of kitchens as social spaces. Some 1930s-1950s kitchens were made so that they only had enough space for one person at a time. Additionally, food and cooking were still sometimes smelly, making the use of kitchens as social spaces not always ideal. What changed, however, was the innovation of the extractor fan, which now helped to draw away smoke from burnt food and smelly cooking. With the removal of smells, kitchens in the 1980s once again, in both middle class and wealthy homes, began to revert as social spaces. Kitchens have been important spaces within houses since prehistoric periods. However, their design remained relatively static until relatively recently in the last two centuries. Few changes occurred before 1800, where major changes included moving cooking spaces away from homes for more affluent homes while other homes tried to minimize the smoke that came from cooking. Moving kitchens away from the home made them less of a social space and more of a work space, while later technology, such as stoves that moved smoke away from the home, allowed kitchens to become more of a social space once again. Additions of gas and water brought in also allowed kitchens to be both functional and social spaces. New demands of work and industrial change meant there was less time for workers, leading to kitchens becoming more work spaces in the mid-20th century. It was the development of even cleaner kitchens, such as the use of extractor fans, that opened the kitchen back up as a social and working space. ↑ For more on kitchens in antiquity in the Mediterranean region, see: Klarich, Elizabeth, ed. 2010. Inside Ancient Kitchens: New Directions in the Study of Daily Meals and Feasts. Boulder: University Press of Colorado. ↑ For more on ancient recipes, see: Kaufman, Cathy K. 2006. Cooking in Ancient Civilizations. 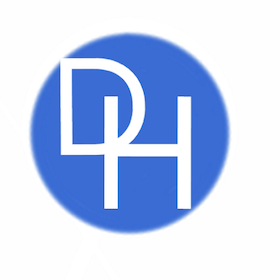 The Greenwood Press “Daily Life through History” series. Westport, Conn: Greenwood Press. ↑ For more on kitchen design and space in the Medieval period, see: Day, Ivan, ed. 2009. Over a Red-Hot Stove: Essays in Early Cooking Technology. Food and Society 14. Totnes, Devon [England]: Prospect Books. ↑ For more on changes in kitchens in the late Medieval period, see: Freedman, Paul, ed. 2007. Food: The History of Taste. California Studies in Food and Culture 21. Berkeley: University of California Press. ↑ For more on the socialization of the living and dinning rooms as kitchens changed, see: Pennell, Sara. 2016. The Birth of the English Kitchen, 1600-1850. Cultures of Early Modern Europe. London ; New York: Bloomsbury Academic, an imprint of Bloomsbury Publishing Plc. ↑ For more on early and more modern stoves, see: Greeley, Horace. 2000. The Great Industries of the United States. Bristol; Tokyo: Thoemmes ; Kyokuto Shoten. ↑ For more on kitchen development in the 19th century, see: Hassan, John. 1998. A History of Water in Modern England and Wales. Manchester ; New York: Manchester University Press : Distributed in the USA by St. Martin’s Press, pg. 13. ↑ For more on kitchens and class, see: Ballantyne, Andrew, ed. 2004. Architectures: Modernism and after. New Interventions in Art History 3. Malden, MA: Blackwell Pub, pg. 13. ↑ For more on changing 20th century designs on kitchens, see: Spechtenhauser, Klaus, ed. 2006. The Kitchen: Life World, Usage, Perspectives. Living Concepts 1. Basel : London: Birkhäuser ; Springer [distributor]. ↑ For more on changing kitchen designs by the 1980s, see: Smith, Paul. 2016. Structural Design of Buildings. Chichester, West Sussex, United Kingdom: Wiley Blackwell, pg. 16.